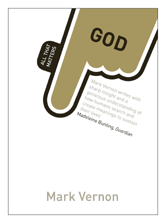 God: All That Matters, by philosopher Mark Vernon, suggests that there is something odd about the way God is discussed today. 1 Is God in suffering? 2 Is God our moral ideal? 3 Is God the same as nature? 4 Is God found in peak experiences? 5 How can we say, God is good? 7 Will God come at the end of time?